Did you know 20-40 percent of current 6-60 ton commercial package and split systems don’t meet new 2016 efficiency minimums? Your boss may not be aware of the changes coming, but it’s a fair guess that he or she expects their team of HVAC professionals to be current on upcoming industry changes. Photo: (L to R) Bart Powelson and Karl Zellmer of Emerson, Richard Lord of UTC, Cindy Sparrow of Lennox, Frank Vadino of Cold Technology. At our Technology in Action Conference last month, we brought together industry leaders to talk about the effect of new air conditioning efficiency standards on contractors, manufacturers and our customers. To understand new efficiency regulations on commercial air conditioning systems, you need to know how they are being measured. 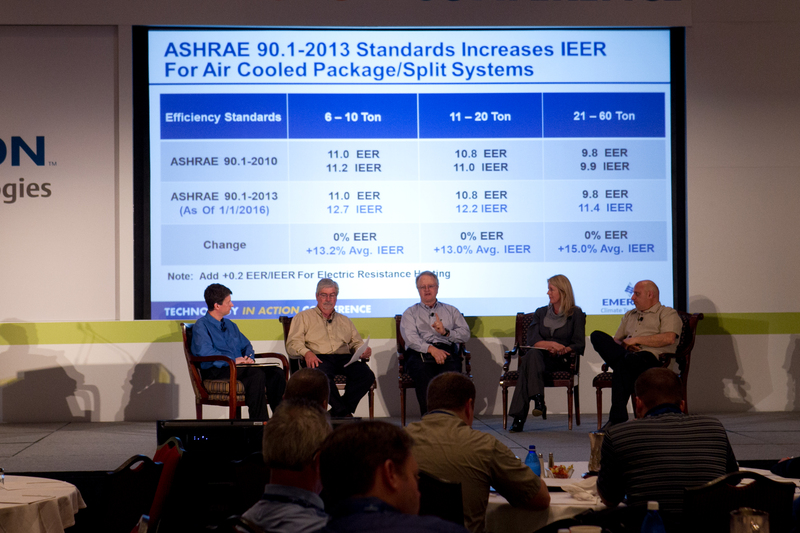 The ASHRAE 90.1-2013 standards include a 13-15 percent increase in Integrated Energy Efficiency Ratio (IEER) for air cooled package/split systems. IEER is a measure of part load efficiency using a weighted average of efficiencies at various system capacities and conditions.Rather than looking at EER, which had been the industry standard for decades, the regulations, which are expected to go into effect in 2016 are focusing on performance across a range of conditions, since typical systems spend most of their time running at 50-70 percent load capacity. The emphasis on part-load efficiency has a great side effect: improved comfort. When it comes to evaluating the performance of an HVAC system, regulatory agencies are focused on energy use, bosses usually care about costs, but let’s not forget that visitors to your store or building care mostly about comfort. Fortunately, the new efficiency standards can serve all three needs. A minimum standard measurement that more accurately reflects how systems run leads to more efficient equipment that will both save on energy use and cost, but also include capacity modulation that can lower humidity and maintain more consistent temperatures. Manufacturers and OEMs have your back and are developing the technology to support the new efficiency minimum standards. While you (and your boss) may be just now coming up to speed on the standards for 2016, many OEMs and manufacturers have been preparing for the new standards for years. Introducing capacity modulation with tandems and variable speed compressors will be the trend to improve part-load performance. Don’t forget to review rebates and voluntary standards. Voluntary standards like Consortium for Energy Efficiency (CEE) and the U.S. Green Building Council are pushing the upper end of the spectrum, creating guides and benchmarks beyond minimum standards.Be sure to impress the boss with your knowledge of energy rebates available on a national and state-by-state basis by visiting the Database of State Incentives for Renewables and Efficiency funded by the U.S. Department of Energy. Training is key. Staying current on the latest developments in technology will be key to helping ensure equipment is running efficiently. Connect with OEMs and manufacturers for training on the equipment your team will be servicing and installing.